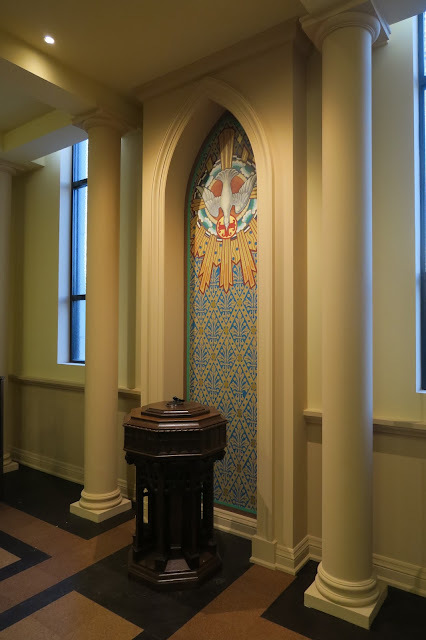 In my recent posting about newest edition of the Adoremus Bulletin, I showed the cover photo of the publication, which is of a beautiful wall panel. I was delighted to hear just now from the architect James McCreery, whose firm was the design architect for the Thomas Aquinas Chapel of the Newman Center. 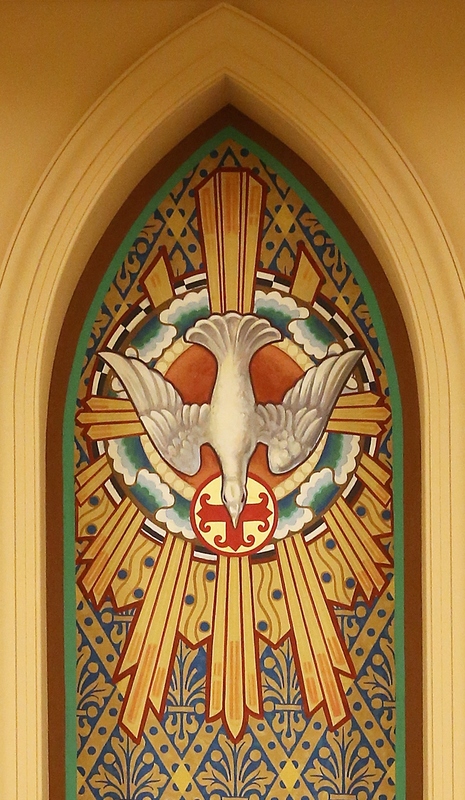 He sent me this fine photo of the panel in its setting, which shows that this was a detail of an arched recess designed as a backdrop for the chapel’s Baptismal font...hence the descending dove! The painting work was done by artists at the Evergreene Studios, he tells me. He explained to me that the font itself is hand-carved oak dating from the English Arts and Crafts / Gothic Revival period of the late 19th/early 20th centuries. This is the movement that came out of the work of Pugin, Ruskin and Morris particularly. I am an admirer of this style, what might be termed Victorian neo-Gothic art and architecture. Some talk of it as though it is a pale version of what went before. I don’t think of it that way at all. To me this is an authentic model of Christian art and architecture that characterizes the 19th century. In many ways I see theirs as a lesson of how revivals ought to take place, one which can help us today. Their method was to study the underlying principles from the great models of the past - in this case looking at Gothic architecture, and Gothic and Romanesque art and decoration - and then apply those principles to a contemporary setting - the 19th century. The desire was to change as little as possible, but it was not an unthinking copying of the past. There was a willingness to modify or change those aspects that were no longer appropriate to needs of the Church of the time, and those aspects which, when considered in humility, might be improved upon. Now, 100 years or so later, the same process goes on. This time the model of the past is the Victorian style and the Church to which it must relate is that of the early 21st century. This is how it works!